Update 9/10/2015: It’s been a week, and I’m recommending this combing conditioner. It kept my curls nice and weighed. I found it really moisturizing for the ends of my hair. I think this would be a great conditioner for winter when everything is extra dry. Update 9/4/16: I went through the ingredients and felt a little concerned about the soybean oil of all things, because it looks like whether it’s a good ingredient or not depends on how it’s processed — naturally through pressing, or through solvent-based extraction. However, I decided to give it a try anyway since the rest of the ingredients looked good. So tonight I combed with it. To its credit, it had been eight days since I’d last combed my hair (instead of my usual seven) because our water heater was broken and I was waiting for it to be fixed before shampooing, conditioning, and combing. The Shea Moisture Coconut & Hibiscus Curl & Shine Conditioner combed well, even with the extra day in between combings. So I’m waiting for my hair to dry to see how well it clumps, and then I’ll see how my hair feels after a week. Then I’ll know if I can recommend this conditioner. 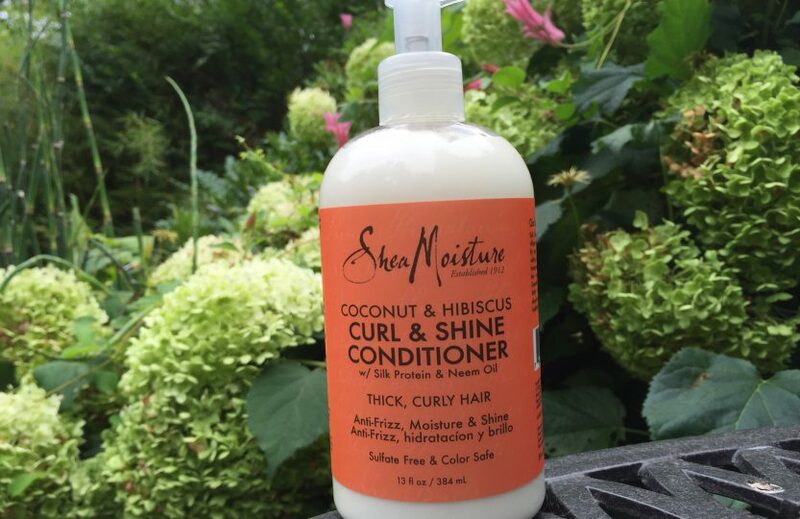 Shea Moisture Coconut & Hibiscus Curl & Shine Conditioner has a warm, almost buttery coconut scent. I’m about half way through looking up the ingredients and adding new ones to the ingredients dictionary. Then I’ll give it a try, I’m hoping in the next week or so.